Every formal meeting requires minutes, but minutes for committee meetings require more attention than for some other types of meetings. That's because a committee must report back to the larger group of people who formed it and those people usually want to know all the details of the committee's meetings. Committee minutes therefore need to be precise. But capturing details of a committee meeting does more than just satisfy the larger group's desire for information — it also ensures that each committee member knows what to do after the meeting. Furthermore, detailed minutes help the committee analyze that meeting afterward so it can improve future meetings. Taking minutes using a word processor can be laborious. Consider using meeting software instead to guide you through all three phases of how to take committee minutes. Taking detailed and organized committee minutes becomes much easier when you have an agenda to follow. When you use meeting software to create the agenda beforehand, it will be available to everyone logged into the software when the meeting begins. The meeting secretary can then fill in minutes as the committee moves through the agenda. Going into the meeting, the secretary also needs a firm understanding of how thorough the minutes should be. Some meetings require minutes only for decisions reached, while minutes for other meetings must include the discussion that went into those decisions or everything said during the meeting. Committee meetings tend to lean toward more information than less. Learn how meeting minutes software helps you prepare to take committee minutes! Usually, the secretary begins the committee minutes by noting the title, date, and time of the meeting and the presence and absence of individual committee members. 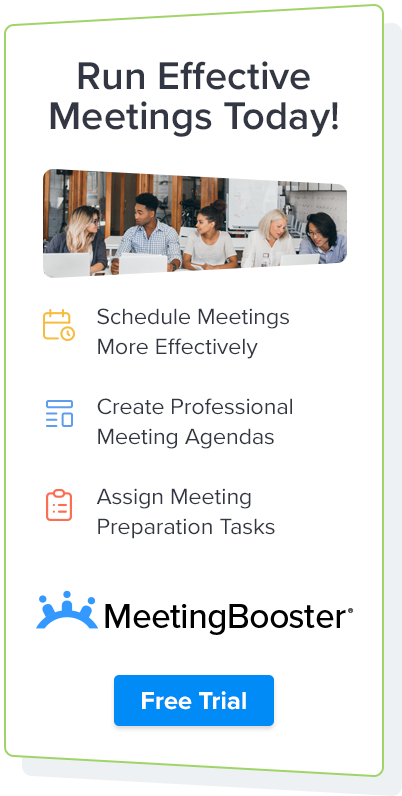 Meeting software, however, does this automatically: the software-generated agenda includes the title, date, and time of the meeting and the software's invitation feature can note who will and won't be in the meeting. With this information automatically recorded, the secretary can focus on taking notes on each agenda topic. A drop-down menu shows each meeting attendee, allowing the secretary to easily record which participant said what. Using meeting software, the secretary categorizes discussion as "Discussion Minutes". Committee decisions and task allocation fall under the category of "Conclusion Minutes". This makes for clean, efficient organization of the committee minutes so that everyone can see the discussion that went into each decision. Use meeting minutes software to record detailed committee minutes! Before the creation of meeting software, finalizing minutes was a tedious process. It required manual organization and formatting of the committee minutes to make them easy for others to follow. By recording committee minutes with meeting software, though, you can automatically organize the minutes as you take them. The software can then instantly format the notes to give them a professional look. Finally, the software automatically archives the minutes, letting you search for important notes later. When you use meeting software, finalizing committee minutes is a matter of simply clicking the clearly marked buttons. Instantly format, distribute, and archive committee minutes with meeting minute software!